HotOrNot is a tiny bookmarklet for checkin who is talking about a link exploiting mash ,one of the coolest YubNub's command ever. 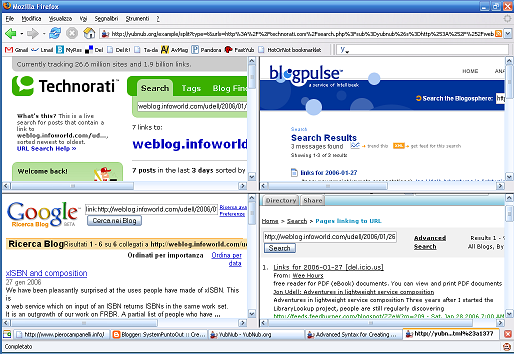 This bookmarklet uses four famous services like Bloglines,Google blogsearch, Blogpulse and Technorati. 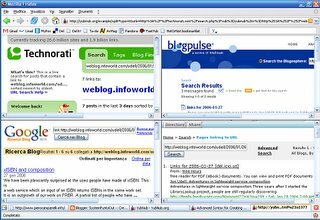 Imagine you are visiting Jon Udell blog and you want to know who is talking around his post..just click on HotOrNot bookmarklet and your screen will be splitted in four with search results. Drag this link HotOrNot bookmarklet to your browser's toolbar and give it a try. I made also the corrispective command on yubnub (hon) ;highlight your url and call it with fastyub . Avete presente i fagioli abbrustoliti cucinati in quei tegami nerastri dai due fenomeni , con tanto di scarpetta finale? 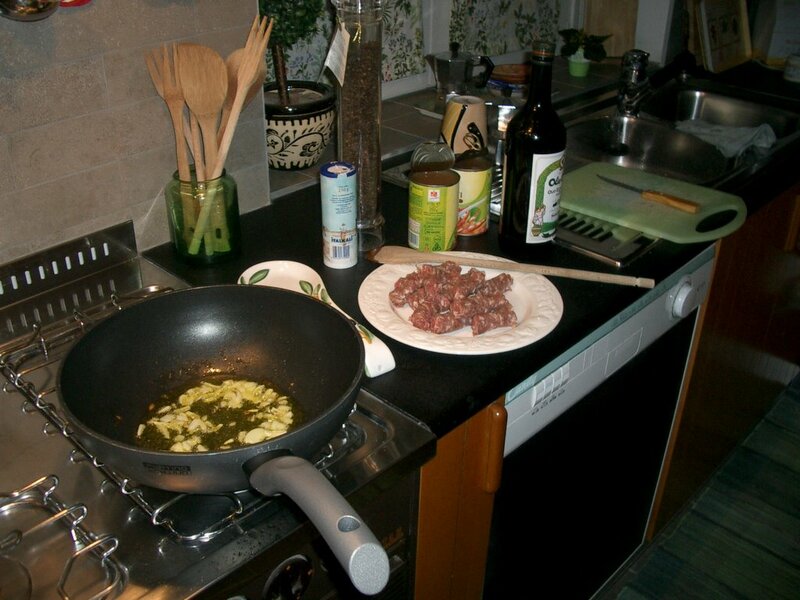 Bhe', ho provato a cucinarli l'altra sera .. posto un paio di foto dell'esperimento. Non ho seguito una ricetta particolare, ho semplicemente ricordato i consigli di un amico meccanico e dei pranzetti veloci che la madre gli cucina. 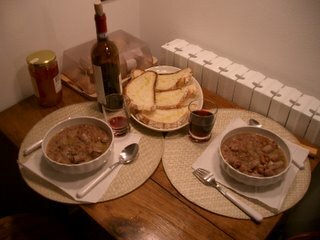 Ho fatto il soffritto con cipolla e salsiccetta, ho poi buttato i fagioli con un po' di brodo , bagnandoli di tanto in tanto con un po' di vino. Per la scarpetta ho preparato del pane rustico con olio, aglio e sale , scaldato nel forno della stufa. Il risultato e' stato soddisfacente, terrine pulite e bottiglia di rosso scolata. Spulciando sul web ho trovato le ricette "originali" (qui e qui), secondo me un po' troppo pettinate per quel bifolco di Trinità. Settimana prossima, sfida a salsicce e birra..
FastYub is downloadable from Mozilla extension repository. I just added FastYub TopTen feature asked by a friend. and thanks to James Cook and his plugin. 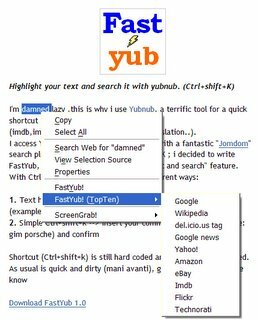 I'm damned lazy ,this is why i use Yubnub, a terrific tool for a quick shortcut to all i need on the web (imdb,images,googlegroups,wikipedia,translation..). 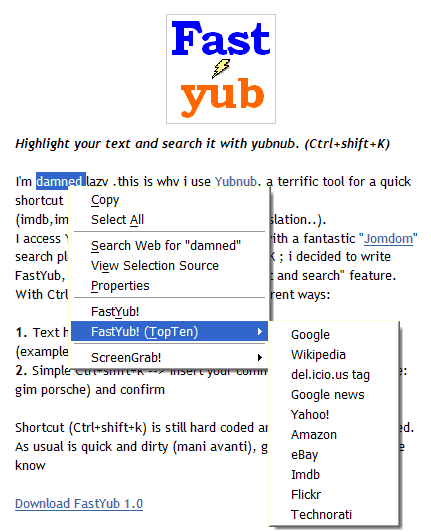 I access Yubnub's command within firefox with a fantastic "Jomdom" search plugin that enable yubnub with Ctrl+K ; i decided to write FastYub, a firefox plugin that add "highlight and search" feature. Shortcut (Ctrl+shift+k) is still hard coded and cannot be customized.